Asking for financial help can be a serious relationship killer, which is why many people would prefer to do anything (including go into debt) rather than ask a friend for money. For instance, you might think that your potential benefactor might be doing better financially than they are, or you might think that they ought to help you when they feel much more comfortable saying no to any such request. In either case, you might end up resenting your friend for saying no. You need to go into the conversation with the recognition that they can say no and that it does not reflect in any way on your relationship if they do. On the other end, your lender might feel that you need to pay them back on a quicker time frame than you are comfortable with. The only way to borrow money from a friend or family member with little chance for blowback is to treat it like a financial transaction and actually use a promissory note. This legal agreement (which will cost about $9 to DIY, and the borrower should be the one to pay for) will spell out the specifics of payment dates, interest, and other loan details. The other important thing to remember about borrowing from friends is that it cannot become a habit — no matter how diligent you are about repayment. If your emergency occurs within a few days of payday, it could be worth your while to talk to your bank about an emergency overdraft. Explain the situation that you are in and tell the bank how much of an overdraft you will need. Be sure to ask how much the fee will be to cover your overdraft. From there, your bank can either approve or deny your request. Depending on the cost of your overdraft protection, this could be a relatively inexpensive way to get the money you need. In an emergency, it becomes clear that some of the stuff you own may be less important than you think. That's a good time to sell some of the things you have kept but no longer need. If you have some time, you can try to sell your things on Craigslist or eBay. If you need money in a hurry, you can take your valuables to a pawnshop. There you have the option of outright selling your goods or pawning them — taking a loan with a set amount of time to buy it back with interest. You are legally allowed to access a portion (generally the lesser of 50% or $50,000) of your retirement plan money tax-free. You are required to repay that amount, plus interest (paid to your account), which will help to restore some of the growth you have lost by taking the loan. Loan rules specify a five-year amortization repayment schedule, but there are no pre-payment penalties if you would like to rebuild your account more quickly. In addition, many plans will allow you to make repayments through payroll deduction, in the same way you make normal contributions. One caveat — if you leave (or lose) your job before paying back the loan, it will be considered an early distribution, which will mean that you owe the 10% early withdrawal penalty and tax on your loan. Strictly speaking, you cannot take a loan from an IRA. However, it is legal to withdraw money from your IRA for 60 days with a tax-free rollover. Basically, you can take money out of your IRA with no taxes or penalties, provided you put the money back into that or another IRA within 60 calendar days. If you fail to replace the money within that time frame, it will be considered an early withdrawal and you will have to pay income taxes on the money and a 10% penalty. Depending on what major bill has unexpectedly cropped up, you may be able to reduce the expense to something more manageable if you do a little shopping around. For instance, emergency dental work does not necessarily have to break the bank. Dental schools are in constant need of patients for students to practice on. A friend of mine who went through dental school at OSU had a great deal of trouble finding patients for each type of procedure she needed to complete for her degree, and even began offering token amounts of money to patients in order to get them to come in for needed procedures. Call your local university to see if they are in need of dental patients — or veterinary patients if it's your cat or dog that is having the emergency. In addition, vocational and technical schools need practice in diagnosing engine problems in cars. Your problem could be good experience for a budding professional, while having a student fix it could cost you a lot less. There are multiple charities that offer one-time cash grants to help individuals in temporary financial difficulty. These grants do not have to be repaid, but qualifications depend on both the limits of the particular charity and your particular situation. Local chapters of the Salvation Army offer one-time assistance to help cover things like rent. To apply, you must visit your local Salvation Army office and prove your hardship. Catholic Charities offers emergency assistance grants for applicants who prove their need. You must apply in person and talk with a caseworker. This charity is funded similarly to Kickstarter. Private donors pledge money to fund specific grants for those in need, and the applicant will only receive the funds if his or her application is fully funded. Anyone with a job can apply. In particular, Modest Needs offers the Self Sufficiency Grant, which provides up to $1000 to cover one emergency expense. 211.org is a program run through the United Way, and it offers an online database of local nonprofits across the United States. How much do you spend each month on food, utilities, gas, and cell phone? You may be able to find enough money in your monthly budget to cover your emergency if you are willing to eat peanut butter and jelly, turn off the a/c, take the bus, and switch off your cell phone data plan for a month. This may sound drastic, but it's preferable to getting into debt just to avoid a few weeks of discomfort. One important and reassuring piece of information I learned from my financial planner father was that the IRS does not care what you say on your W-4, as long as you tell them the truth come tax time. That's because the W-4 is simply a form that tells your employer what your allowances are — not a legally binding claim to the IRS. What that means is that you can potentially adjust your withholding on your W-4 form at your workplace and see more money in your very next paycheck. By claiming more allowances on your W-4, you will be sending less of your money to the IRS. If you regularly get a large refund, you can figure out exactly what your withholding should be using the IRS online withholding calculator. In this case, once you've adjusted your withholding, you can keep it at the adjusted amount for the rest of the year and save the difference (ideally in an interest-bearing account or in your retirement account). Websites like GoFundMe offer opportunities to raise funds through online donations. These sites allow you to create a profile explaining who you are and why you need the funds. Donors give money to your campaign, and the site takes a percentage of the donation for operational costs. The fundraiser can withdraw the money raised on GoFundMe at any time. GoFundMe has no campaign deadlines or goal limits (although other crowdfunding sites do), and the service is free for the fundraiser. No matter where you live or what you do, it's likely that you own something someone else might need temporarily. For instance, if you live in an area that draws tourism or business travel, you might be able to rent out a room (or even the whole place, if you crash at a friend's house) on Airbnb. Alternatively, if parking is at premium in your area, you could rent out your parking space or garage while you perfect your parallel parking skills (or leave your car elsewhere and take the bus for a few days). Check out sites like ParkingPanda and JustPark. Finally, as long as your car is not the basis of your emergency, you could rent it out to visitors who need wheels on RelayRides. In the best-case scenario, we would all have a robust emergency fund and appropriate insurance for every possible curve ball. 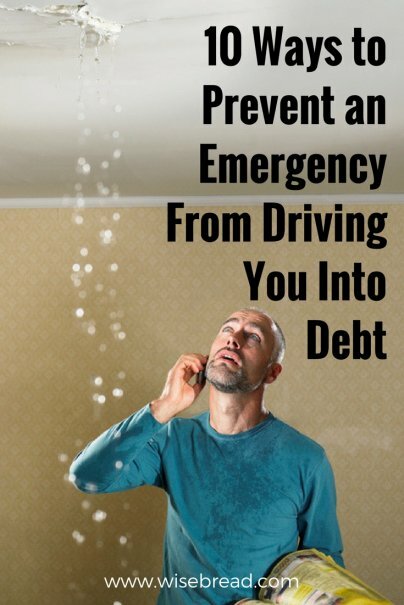 But even the best-laid schemes "gang aft agley," and it's important to remember that paying for an emergency does not have to mean taking on debt. Have you been fortunate enough to navigate an emergency without crippling your finances? What was your strategy? Please share in comments.